Alex practices intellectual property law with a focus on patent, trade secret, and trademark litigation. During his time at Carlson Caspers, he has worked on cases involving a range of technologies, including wireless communications, fiber optic communication systems, computer architectures, semiconductors, lawn care equipment, nutraceuticals, and medical devices. Alex has significant experience in all stages of intellectual property litigation, from pre-suit investigations, discovery, and dispositive motion briefing, all the way through trial and appeal. Recently, he was involved in a multi-million-dollar Carlson Caspers trial win and has defended a major medical device maker against allegations of patent infringement. Alex also recently has provided patent counseling and freedom to operate opinions to medical device makers and represented a major concrete manufacturer against allegations of trademark infringement. 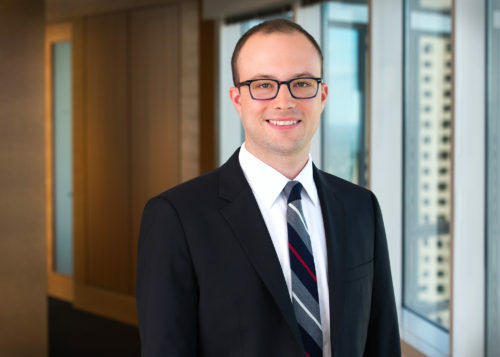 In addition to his practice in district court litigation, Alex has experience in inter partes review proceedings at the U.S. Patent and Trademark Office. Alex brings technical expertise and unique analytical experience to the practice of law. Prior to law school, he earned a master’s degree in physics and worked as an intelligence analyst at the CIA. Recently, Alex was named a “Rising Star” in Minnesota Law & Politics magazine. He also is a member of the Minnesota Advisory Committee for the U.S. Global Leadership Coalition, which works to educate the public and policy makers on the benefits of U.S. international engagement.